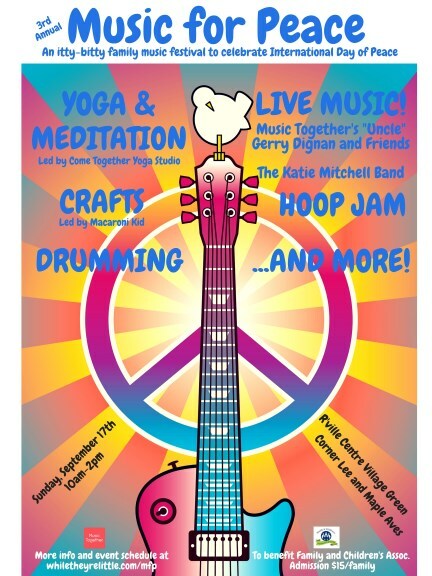 Join us for the 3rd Annual “Music For Peace”, an itty bitty family music festival in celebration of International Day of Peace, on Sunday September 17th 2017, from 10am-2pm at the Rockville Centre Village Green. Our day begins with a peaceful group yoga and meditation session led by Come Together Yoga teachers. Bring a drum and/or hula-hoop for our community Drum Circle (led by Jim Oshinsky) and Hoop Jam. Enjoy some rock tunes played by Long Beach's own The Katie Mitchell Band. Paint inspirational words of love and peace on a Kindness Rock - these rocks will be left in random places in the community. Shop for non-toxic products for home and your family at the PUREHaven tent. Get your face painted by Kitten Face Arts or have a sweet treat from the Kona Ice truck or a cookie from Dover Girls Desserts. The day also includes a special live performance by Music Together® recording artist, “Uncle” Gerry Dignan so get ready to sing and dance to some of your favorite Music Together tunes with all your favorite Music Together teachers! Bring a picnic blanket, your voice and your good vibes to send out a collective wish for peace for all children and people everywhere!! The event is open to the public and admission is $5 per person with a $15 per family maximum, all to benefit the Family and Children’s Association. Thank you to all of our wonderful sponsors and volunteers!